The National Association of City Transportation Officials (NACTO) and the Global Designing Cities Initiative today announced the launch of the Global Street Design Guide as a globally accessible document that can be downloaded at no cost, allowing urban planners, designers and transportation practitioners in cities around the world to immediately implement tested and life-saving street designs. The worldwide release of the guide, made possible by the Bloomberg Initiative for Global Road Safety, will also soon include translations into Spanish, Portuguese, Mandarin and other languages making the guide even more accessible. The launch comes as 29 cities and 15 organizations—including London, Buenos Aires, Sydney, Addis Ababa and Toronto—have endorsed the guide as a new standard for transforming streets to prioritize safety, pedestrians, transit and sustainable mobility. “City streets are at the center of so many big challenges facing the world, from health and safety to climate change. This guide helps city leaders meet those challenges in ways that also connect people to jobs and services and bring new life to neighborhoods. The guide is full of creative ways cities are reshaping streets to better serve the public – and if those ideas spread around the world, they can help improve billions of lives.” – Michael R. Bloomberg, Founder of Bloomberg Philanthropies, and Former Mayor of the City of New York. “This launch puts the guide where it’s most needed—into the hands of planners, citizens and leaders in hundreds of cities.” – Janette Sadik-Khan, NACTO chair and principal at Bloomberg Associates. “Having access to a global guide means we can utilise the best designs from around the world to ensure our city is a healthy place to live and work for everyone.” – Leon Daniels, Managing Director, Surface Transport, Transport for London. “Streets are the foundation of a city’s entire social structure—getting around, working, living, shopping, and playing. With the guide, cities have, for the first time, a universal resource for creating cities that operate for everyone who uses them.” – Enrique Peñalosa, Mayor of Bogotá. “We need to change the way we measure the success of our streets. The Global Street Design Guide helps us shift away from evaluating our streets from how many cars they move to how well they serve everybody who uses them—and what new choices they offer for getting around safely.” – Juan Jose Mendez, Secretary of Transportation, Buenos Aires. The Global Street Design Guide has been endorsed by 29 global cities, including Accra, Ghana; Addis Ababa, Ethiopia; Auckland, New Zealand; Bandung, Indonesia; Bogota, Colombia; Buenos Aires, Argentina; Charlotte, USA; Chicago, USA; Fortaleza, Brazil; Helsinki, Finland; Kabul, Afghanistan; London, UK; Los Angeles, USA; Melbourne, Australia; Mexico City, Mexico; Nairobi, Kenya; New York City, USA; Philadelphia, USA; Pittsburgh, USA; Recife, Brazil; Santiago, Chile; Seattle, USA; Stockholm, Sweden; Sydney, Australia; San Francisco, USA; Sao Paulo, Brazil; Tirana, Albania; Toronto, Canada; and Vancouver, Canada. Globally, 1.25 million people are killed in traffic deaths, often the result of road design that contributes to high speeds and dangerous driving. 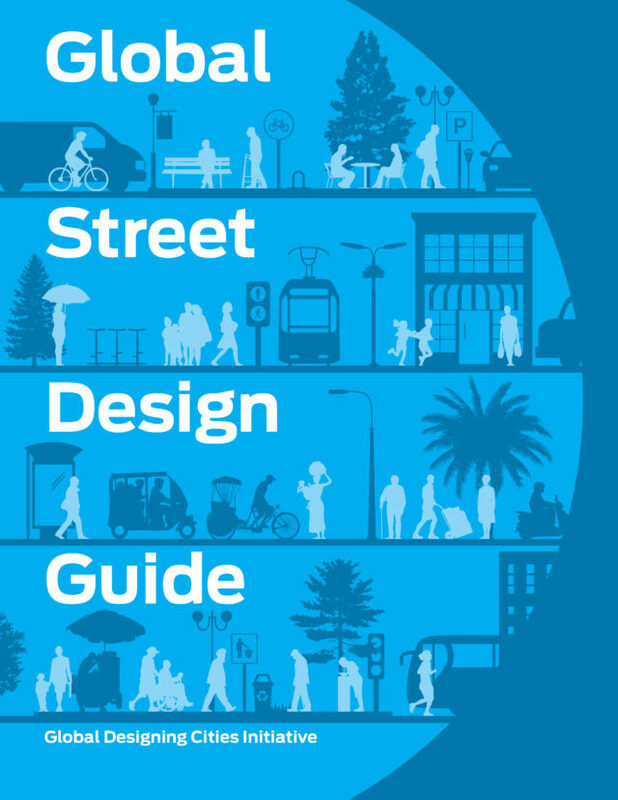 Created with the input of 72 cities in 42 countries, the Guide presents essential street types and unique street and intersection transformations that put people first and that can be applied to streets worldwide. With over 40 case studies from cities of wide ranging populations, the Guide shows possibilities from moving more people with transit lanes, to dedicating space for vibrant economic activity like street vendors, and provides a toolkit of street designs that can be applied in a variety of contexts worldwide. Street design is also the key to resolving larger issues of cities’ economic vitality, livability, and physical and social mobility. The Guide comes as urban populations increase around the world and amid a sea change in the number of cities designing, testing and implementing street transformations. The Global Street Design Guide is available for purchase from Island Press and can be viewed and downloaded for free at GlobalDesigningCities.org. In addition to 29 global cities cities, the following organizations have endorsed and supported the Guide to date: 8-80 Cities; Automobile Club of Moldova; Belarusian Auto Moto Touring Club; Bernard van Leer Foundation; C40 Cities; Eastern Alliance for Safe and Sustainable Transport; FIA Foundation; Global Road safety Partnership; Inter-American Development Bank; Institute for Transportation and Development Policy; John Hopkins University Bloomberg School of Public Health; Partnership for Road Safety Foundation; Save Life Foundation; Vital Strategies; the World Resources Institute Ross Center for Sustainable Cities; and the World Bank. Development of the Guide was supported by Bloomberg Philanthropies, as part of Bloomberg Philanthropies’ Initiative for Global Road Safety. NACTO is an association of 51 major North American cities formed to exchange transportation ideas, insights, and practices and cooperatively approach national transportation issues. The organization’s mission is to build cities as places for people, with safe, sustainable, accessible, and equitable transportation choices that support a strong economy and vibrant quality of life. The Global Designing Cities Initiative (GDCI) focuses on the critical role of streets within urban environments around the world. In partnership with the National Association of City Transportation Officials (NACTO) and working with a Global Expert Network, the GDCI is committed to sharing industry best practices, facilitating peer-to-peer mentoring and fostering regular communication. The GDCI facilitates the exchange of ideas that help a variety of stakeholders shape streets to promote public health and safety, quality of life, multi-modal mobility, economic development, environmental sustainability and equity. GDCI believes that by working together, cities can save time and money, share lessons learned, scale up best practice implementation and more effectively achieve their policy goals and objectives. Bloomberg Philanthropies works in more than 120 countries around the world to ensure better, longer lives for the greatest number of people. The organization focuses on five key areas for creating lasting change: Arts, Education, Environment, Government Innovation and Public Health. Bloomberg Philanthropies encompasses all of Michael R. Bloomberg’s charitable giving, and includes Bloomberg Associates, an international consulting service that aims to help city governments improve the quality of life of their citizens.